I have owned a copy of this 1945 history book for a number of years but had not read it until this Thanksgiving season. Born in Colorado, Willison (1896-1972) specialized in American history. He even wrote the CliffsNotes for The Federalist and also for Pilgrim’s Progress. Sometimes it is hard to read a lengthy history book (this being about 450 pages) just for fun, but this can easily be the exception. Willison traces the history of the Pilgrims, known only as Separatists and sometimes as Brownists (a name taken from the separatist Robert Browne), from their retreat to Scrooby, England, to their further retreat in Leydon, Holland, to finally their removal to America. His historical notes are based mostly on William Bradford’s Of Plymouth Plantation, which traces their history throughout the first half of the seventeenth century (1606-1647), the main and endearing characters being Bradford, William Brewster Edward Winslow, and Captain Miles Standish. In addition are helpful descriptions of Baptists John Smyth, Roger Williams, and the American Indians Squanto and Samoset. 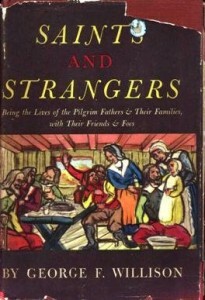 “Saints” refers to the believing Pilgrims, and “Strangers” refers to others who came.